At Linens, Things and More… every wedding décor collection is custom-made for each couple. Yolanda and Henry wanted a unique design for their wedding ceremony on the beach, and we think you will agree our décor design team delivered an amazing look with these custom acrylic cylinders! By using a clear acrylic base, our team kept the focus on the natural beauty of the beach and blue skies. 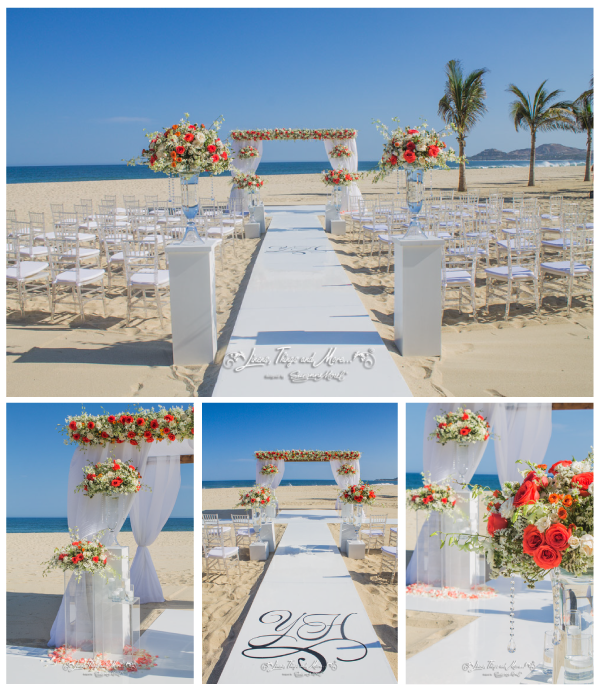 The bright, fresh florals really popped against the sand, and even appeared to float in the air as they framed the aisle for this perfect afternoon in Los Cabos! Those same clear cylinders looked fabulous at the reception, where our team repurposed them as tall centerpieces. The sweetheart table was framed with the same gorgeous “floating flowers,” and was also draped with a beautiful floral runner, creating a stunning effect! We loved this unique idea and we are so happy Yolanda and Henry chose our décor design team for their beautiful Cabo wedding! Remember, every wedding you see on our blog is custom-designed by our team—no two weddings will ever look the same! 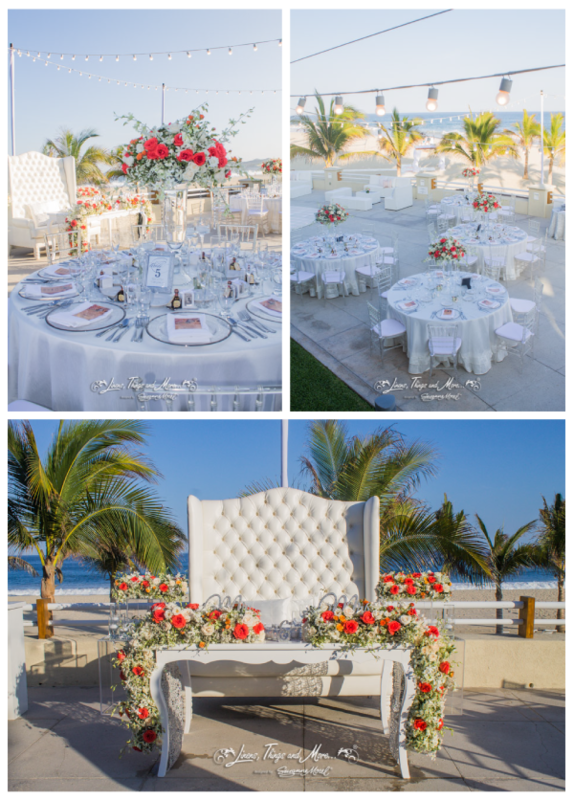 Contact us today to start planning the custom wedding décor of your dreams in Los Cabos! This entry was posted in Accessories and decor, Barcelo Los Cabos, Cabo event design and decor, Cabo Floral Studio, Cabo Flowers, Wedding Inspiration, Weddings and corporate events decor and tagged Barcelo Los Cabos, BEACH WEDDING CEREMONY, BEACH WEDDING DECOR, beach wedding flowers, beach wedding sweetheart table, CABO FLORAL STUDIO, Cabo wedding design, Cabo wedding rentals, clear acrylic base for wedding flowers, clear acrylic cylinder, clear acrylic vase, custom aisle runner, custom wedding decor, destination wedding decor, Mexico wedding decor, string lighting Cabo, wedding ceremony arch, wedding floral runner, wedding reception decor.